There was a time when one of the most preached phrases in marketing was “The money is in your list.” While that may not be everyone’s top phrase any longer, it’s still very true. 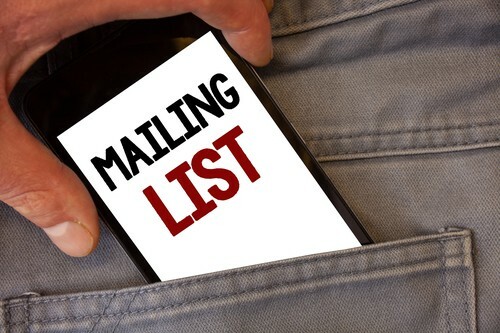 Collecting email addresses from website visitors is a great way to keep in touch with your audience. So how do you get people to just give you their email address? You must give them something of value in return. Give them something they can learn from in relation to your product or service, but also leave them wanting more. Don’t give away ALL of your secrets! Now that you have them signing up, what do you do with the addresses you have collected? There are a vast number of CRM systems you can use. According to searchcrm.techtarget.com, Customer relationship management (CRM) is a term that refers to practices, strategies and technologies that companies use to manage and analyze customer interactions and data throughout the customer lifecycle, with the goal of improving business relationships with customers, assisting in customer retention and driving sales growth. CRM systems can also give customer-facing staff detailed information on customers’ personal information, purchase history, buying preferences and concerns. Deciding which system is right for you. Start sending new product announcements, newsletters, specials, and information that you think your audience will find interesting. This list should get the heads up on new items and specials before you announce it through other marketing channels. Monitor your open and link clicks stats to see what people are interesting and give them more of it. I recommend sending only one or two emails per month so as not to be labeled as spam. This is another blog post that could go on for days so we just covered the basics. If you do not have an optin on your website to collect email addresses, you could be missing out on numerous opportunities. Contact me if you would like to discuss your lead magnet or CRM options in detail. Next week we will cover getting started marketing in general. Once again we will be hitting on the basics because to cover all marketing we would need to write a book!